After a busy Summer, today we launch entry registrations for our weeklong rally in Muscat, which has been tailored to include local and regional owners of iconic marques – both contemporary and classic. Also, I’m really happy to inform you that the Oman Ministry of Tourism has agreed to become our lead sponsor, offering to put their full support behind creating a fabulous gala to celebrate this iconic event in style. For participants, this means a greatly enhanced experience on the final night, where we’ll be able to throw a fabulous party in honour of heritage, innovation, engineering excellence, and great driving experiences! 7-13 December 2015: a weeklong cavalcade of classic, prestige and sports cars. LONDON / MUSCAT 1st SEPTEMBER 2015. Rally Royale is pleased to announce that the Ministry of Tourism will be supporting its efforts by providing logistics arrangements and delivery of its celebratory gala event on its inaugural Rally Royale Oman Grand Tour from 7 to 13 December 2015. Rally Royale hopes this rally will become a regular addition to the events calendar for the region, attracting an esteemed audience of classical and prestige car enthusiasts to the country. Plans are in place for two key events, a 20-day long-distance (the first ever for the region) in Autumn 2016 and weeklong rally. 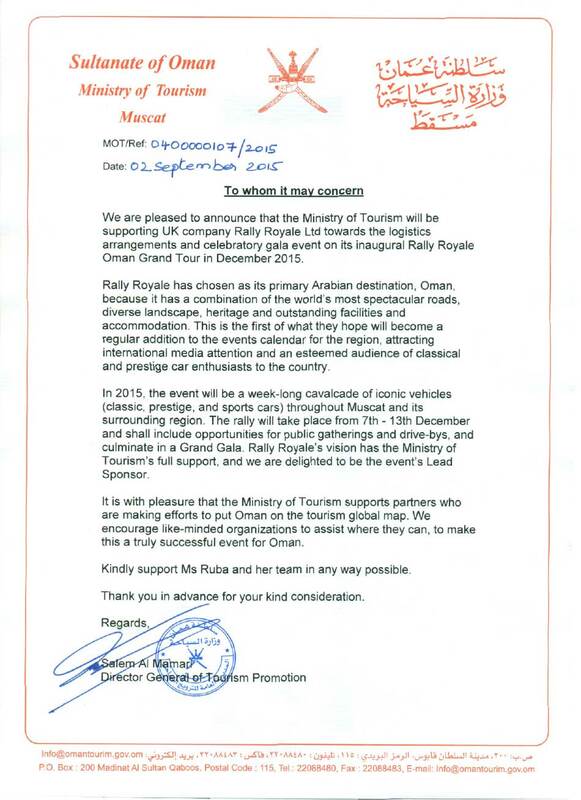 Today Rally Royale launches its weeklong cavalcade of iconic classic, prestige, and sports cars throughout Muscat and its surrounding region. The rally will take place from 7 to 13 December and will include public displays and drive-bys, culminating in a Grand Gala for dignitaries and participants. Ms Jurdi says, “I’ve been to Oman many times. I’ve travelled the full length and breadth of its land, and I’ve had the pleasure of making wonderful friends from all over the world there. The Sultanate of Oman is the diamond in the Crown of Arabia. For our December event, we’ve received a lot of interest from Oman as well as the region’s car clubs, individual owners and enthusiasts. Internationals from further afield are also expected to join. The registration fee for joining the full event is OMR575 per vehicle. For weekenders who want to join just the key events (including the Grand Gala) from Thursday evening to Sunday morning, the registration fee is OMR350.